A very short post. The migraine is dancing on my head. Though the devil continues to dance on my shoulder. Those who have been reading for a while will know of my obsession with a figure which appears like a vein through art and architecture here in the UK, and though I know who he is, I can’t yet fathom his origin. First spotted as a grotesque on the outside of Christ Church College, Oxford, he made a startling appearance on a piece of silverware bearing the crest of The Champneys, an English noble family, dating from 1740 and shrouded in mystery. The piece sits in Oxford’s Ashmolean Museum. From Oxford to Winchester, and the strange Lady Chapel where you can find ancient wall paintings, featuring miraculous stories of the Virgin Mary. Here, at last, the creature bears identification: he appears with an unequivolcal name. He is the Prince of Darkness himself. Read about my search so far- and have a look at the pictures of previous sightings – here. Construction of the parish church of St John The Baptist, Cirencester, in the South of England, began in 1115. The Romans had long upped and gone by then, though they left their traces. This cathedral-like church, made in golden Cotswold stone, is deeply, engagingly, uncompromisingly mediaeval in so many ways. I popped in for a three-minute stroll and stayed for a couple of hours; and towards the end of my walk, who should I spot, there in the tower, snarling down at the unsuspecting tourists? It’s him again. Same snout, same claws, same wings. Is there anyone else out there who has met him in this 900 year old incarnation? Where did he begin, and how far has he travelled? And how did he endure, from early mediaeval symbolism, to perch on the elaborate sauce-boat possessed by a noble English family in the 17th century? Posted in Quirks of HistoryTagged church architecture, devil, grotesques, prince of darknessBookmark the permalink. Is he variable, incarnated by the imdividual through their own experience, re-inforced by what is shown or spoken of by others. A consensus builds, and he develops a consistent appearance? The first editions of legends translated into stone or paint would tend to set the pattern? I’d love to see evidence of those, Col! Which work first generated this particular creature, I wonder? I wonder, too. Extraordinary that such creatures seem to ‘grace’ the portals of places of worship – I seem to recall that you have found other seemingly inappropriate images. Well, Quite. It was the silverware from the 1700s that spooked me. He was still around after all that time. Someone, somewhere, knows more about this creature than we do. And on the drain pipes in Cambridge! In the UK made by stonemasons, in the US form a plaster like compound. I’ll see if I have a picture in my folders. Ooooh, Solveig, I’d love to see some photographs. Which could date our creature to the eighteenth or nineteenth centuries? Tom Waits wrote, “there ain’t no devil, that’s just god when he’s drunk.” Maybe dualities that big do exist. Is it a medieval Logo Kate? It seems that we humans have found it difficult to create a convincing image of the malevolence that sadly seems to be such a large part of our nature.Maybe it would be just too frightening. I hope your migraine has gone by now! Every time I saw a gargoyle on a building in Italy I thought of you! This conundrum is not one for consideration while suffering from migraine! A fascinating one to pursue with a clear head, though. Curiouser and curiouser, Kate. I’m sure you will find the answer. Rest well, my friend. I hope that migraine abates soon. Interesting that you’re thinking about the origins of this devilish creature while suffering a devil in your head. Hope you start feeling better, the image of the grotesque must be what the migraine feels like after two days. Now, that is REALLY interesting, Nancy. I never dreamed this creature might have travelled that far! Thank you! You’re welcome. When I was looking at this post, the Jersey Devil came to mind immediately. Your guy also reminds me of the photos that Cotton Mather drew of the devil in his writings around the time of the Salem Witch Trials in 1692. 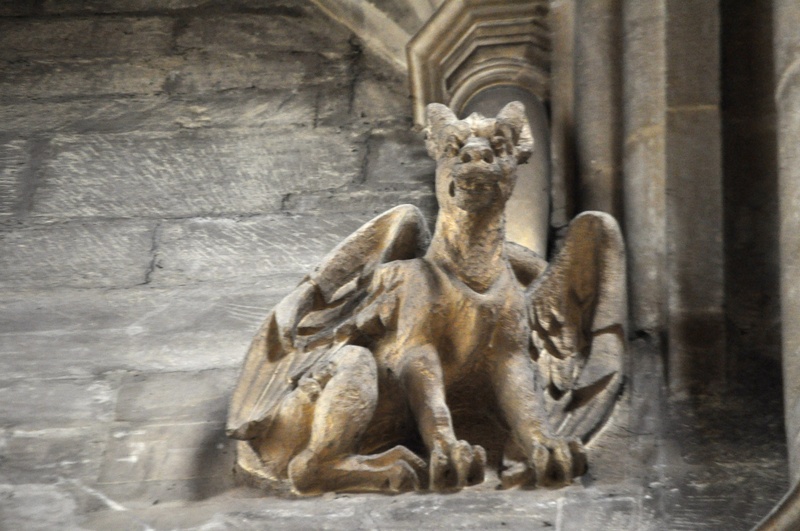 The first I saw creatures like this was on the Notre Dame Cathedral in Paris. I heard they were drain spouts. I am puzzled why the architects – or whoever – decided that this needed to be put on a church. Wouldn’t superstitious folks who lived back then have been scared away from entering? Feel better Kate. Do you have migraines frequently? I love him. I know I shouldn’t, but I do. Someday I will need to come do the Kate Shrewsday gargoyle tour of Britain. Until then I console myself with finding them here in the US – the much younger progeny of those you see. Just recently found some new ones in my church – where I have been sitting every single week for the past 15 years! Mythology consists of the “unconscious” symbolism of a culture. Dreams consist of the “unconscious” symbolism of an “individual”.